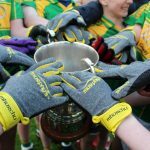 Minor A North Board League – Caltra v Claregalway in Caltra. Saturday March 16th @ 5pm. 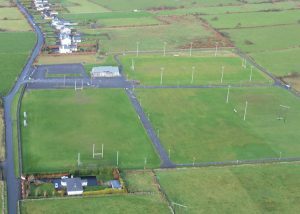 Division 2 Senior League – Claregalway v Kilconly in Knockdoemore. Monday March 18th @ 15:00. The season is slowly starting to ramp up – there are plenty fixtures set over the next few weeks. 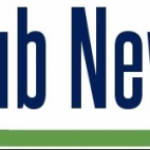 Please get out and support the club when you can and keep an eye on the fixtures and results section to keep up to date. 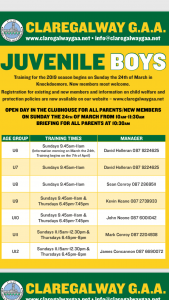 An open day for the Juvenile Boys and Girls takes place on Sunday the 24th of March at 10:oo in the Knockdoemore club house. 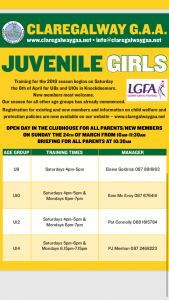 The Under 8 and Under 10 Girls are back training on Saturday the 6th of April. All other ladies age groups are already back training. Further info on training times on other parts of this site. 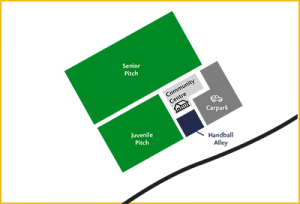 The Easter camp (for kids aged 6 to 13) takes place from the 15th till the 18th of April (4 Days) and runs from 10:00 till 14:00. Cost is €40 per child. €30 for the second child or €90 for a family of 3 or more. For more info please read the flyer on the link below. The Club social is provisionally booked to take place on Saturday the 13th of April. More details will be available on Facebook or on this website in due course. 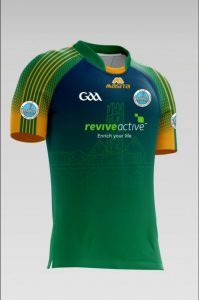 Claregalway GAA club is working closely with Roinn na Gaeltachta to establish the strength of the Irish Language in the area and to find ways that community and sporting organisations in the area can receive language, cultural and financial supports to enhance the Gaeltacht identity. The jackpot stands at €7,000. If you have already registered – thank you. The club will be in contact in due course in relation to the above.